Background: I saw this game on the Playstation Store and decided to download the demo since the trailer made me think it was going to be somewhat similar to the new 3DS Pit game. Faery: Legends of Avalon is priced at $15 and I had to see if this price was justified. The game's story is about saving the land or something and your character was frozen in a gem and now can save the day. Initial Impressions: The first pain I experienced was the long loading time to get to the start menu of 7 seconds followed by 20 seconds to get into the game which is really bad considering it was installed to the harddrive and the ingame art assets are such low quality. At least the loading sprite of a leprechaun type folk was entertaining. The game prompts you to build a male or female fairy which is really nothing more than selecting like 1 of 8 faces and then using sliding scales to change facial features slightly. For my fairy, who I named Link, I choose the darker looking face with dark tattoos under his eyes. I changed his hair color to a hot pink/purple to be more accurate. Graphics: Wow, I didn't know this game was being released for PS2. The "graphics" in this game are an insult to 2011 and especially one being sold. I highly doubt the game is using PhysX to any end except for the logo being used on the title screen. The character models are barely passable and look worse than Oblivion's faces. I would say they are at the same level as Morrowind's faces but that's an insult to Morrowind and its huge world. The demo area in Legends of Avalon is bland with the ground texture looking especially unfinished as if it was a placeholder for the game's alpha testing. I usually wouldn't care as much about the graphics if the gameplay was excellent. Let me put this simply, the best artwork is the game is the rendered concept art above used in the storefront to lure unsuspecting people to make a purchase based on a false pretense. It's what invited you into this demo review. Not since the movie cover of Nim's Island have I been mislead into believing a dog turd wrapped in shiny paper is candy. Gameplay: Unfortunately the gameplay was boring, which is the opposite of a video game's goal. Fly around, talk to people with uninteresting dialogue wheels ala Mass Effect. Oh the dialogue was functional without being too eloquent. Try and recruit someone to your party by doing quests for mystical creatures/faeries. I didn't even get to the turn based combat section because after 10 minutes, I was ready to delete the demo and reclaim my 560mb so I could play the Mass Effect 2 / Dead Space 2 demo. I didn't even get how turned combat makes sense in this game when the main character can travel at the speed of light yet can get hit by a goblin's tongue. 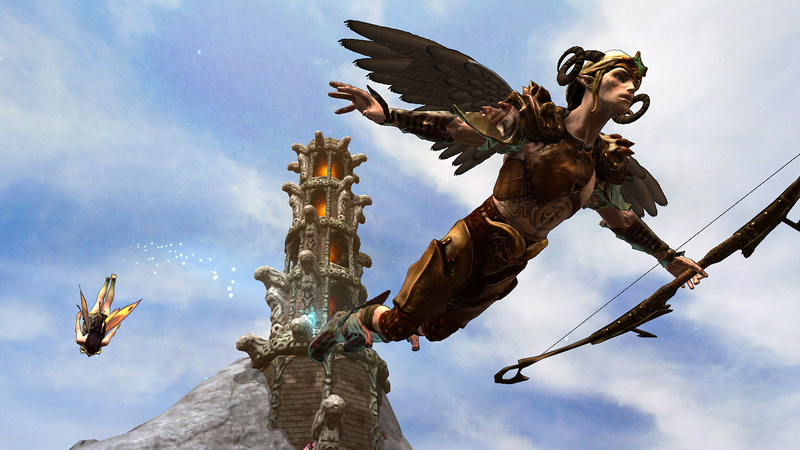 The fairy could easily fly really high and snipe potential enemies without ever getting hit. Controls: "He flies like an eagle on the wing". Yeah, not how I would describe the flight mechanics. The controllable character's flying is like he is hovering rather than flying. He makes jerky movements left and right and awkwardly moves upward and downward with R1/R2. Yet if you push L3, he takes off like a rocket and goes far too fast. If you hit something, he just kinda gets stuck or goes around it slowly. Take, take, take it all but you never give. Should of know you was trouble from the first kiss. I took the grenade for ya, so don't pay the $15 dollars for this. Go get one of the same priced triple AAA downloadable titles like Braid, Limbo, Castle Crashers, Super Stardust HD, Geometry Wars, Puzzle Quest, Fat Princess, Wipeout HD, any of the PixelJunk games, Plants vs. Zombies or any of the indie games on PC/Steam. Don't make the mistake of buying this turn based fairy flight dialogue sim; get the Folklore on PS3 for a better fantasy game. I support Indie developers but please at least make me believe this is a finished game instead of a side coding project for a graduate class group project.